Those who believe that the first few games of a season set the tone for the remainder were more than a little bit despondent after defeats against Dundee and Livingston. McFadden was injured and Adams was suspended for the first two games but their return produced a remarkable turn around in our fortunes. 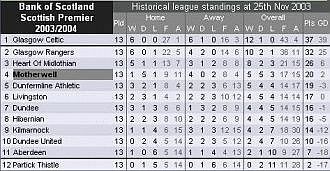 The club was still in administration and another year at the bottom of the table would have been a disaster but a league run of eleven games with only one defeat at Parkhead saw us race up the table to fourth position. The ignominious CIS cup exit at Forfar hardly raised any concern as Butcher’s youngsters set about securing our SPL survival. Several away ground ‘bogeys’ were laid to rest as we racked up wins at Easter Road (2-0), Tannadice (2-0) and Pittodrie (3-0). What impressed was the style of play on show. We were very positive when in possession with fast passing on the ground and often a chip over the top of defences to let Craig or Clarkson chase. We would get behind the ball when the opposition had it and then press and hustle to force an error. The run included several notable events.Faddy departed early on. 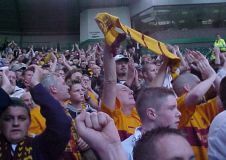 His last game was against Thistle at Fir Park and his parting gift was a stunning run from the halfway line, past three defenders before curling a shot into the net.John Boyle announced that he was to step down and Bill Dickie took the chair in the boardroom. Scott Leitch succumbed to a shoulder injury and would miss the rest of the season. Clarkson celebrating became a regular sight! The bubble burst in December. We managed only one point from five games but the chasing pack was unable to take advantage. Pearson had lost interest and it was felt that the sooner he moved on the better. 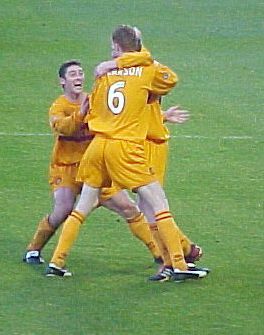 We reached the halfway point with the New Year game at Fir Park against Dundee United. The first half was dire. We were one down and few fans would have predicted what was to happen next. Terry read the riot act at the break and a rejuvenated team appeared. They were full of fight and enthusiasm – and Clarkson stole the show with a hat trick (one with the left, one with the right and one with the head). We were fifth in the table and we fancied out chances for a cup run. 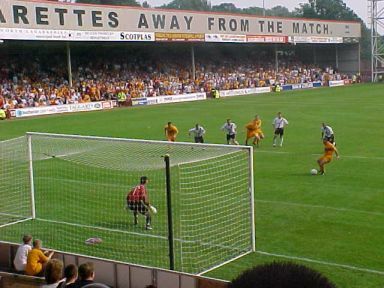 The third round opponents awaited at Perth. All the results, match reports and historical league tables are availablehere.